The retaining wall and stockade fence built behind homes at the upscale housing development known as the Reserve at Poplar Plains on Grassy Plains Road. Construction of a 9-foot-tall retaining wall and 6-foot-high stockade fence along a conservation easement line at an upscale housing development on Grassy Plains Road is the target of a petition drive by a grassroots organization, which contends the work is illegal. “An outfit called Grassy Plains LLC, headed by lawyer and principal Alan Spirer, and Wright (Home Works), has ignored the town’s Conservation and Planning and Zoning approvals and regulations as well as a stipulated court judgment,” according to Matthew Mandell, a District 1 member of the Representative Town Meeting. Mandell said because of this, the Partrick Wetlands Preservation Fund is re-organizing as an ad hoc group to “once again protect the land, the community and the environment from overdevelopment and abuse.” The housing development is adjacent to the Partrick Wetlands area. Mandell, the fund’s director, said he spoke only as a member of that group, which has also launched the petition drive about the issue. “This is the largest transgression I have seen by any developer against the town and its regulations in the 15 years I have been following Planning and Zoning (Commission),” said Mandell. Mandell listed the items of concern, including a 9-foot high retaining wall built along a conservation easement line more than 150 feet long and which comprises more than 125 concrete blocks weighing almost two tons a piece. This is not allowed, Mandell said. Also not allowed, he said, is the 6-foot-tall stockade fence on top of the retaining wall. Jeff Block, co-chairman of Save Westport Now, said, “SWN supports the most effective enforcement of conservation and zoning regulations,” and urged the public to become aware of this issue and other similar problems in town. Spirer, the Grassy Plains principal, agreed Monday there is a problem. 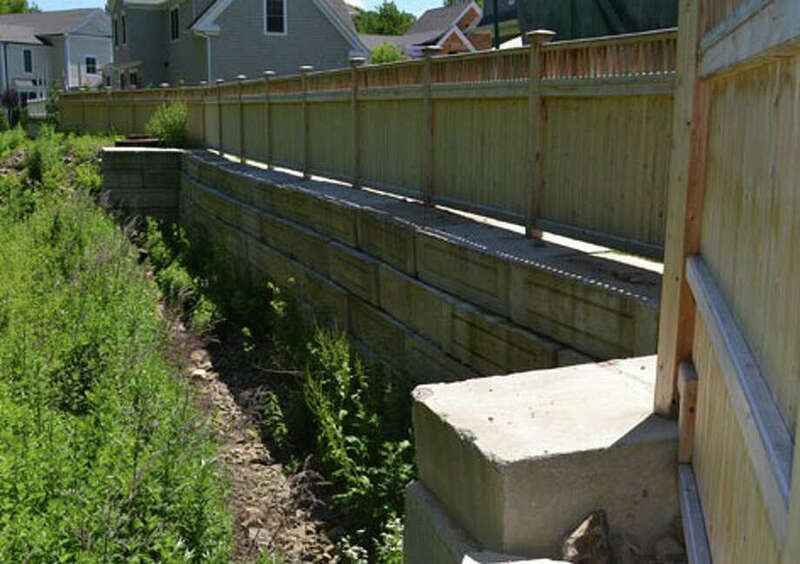 “We should have asked for permission and approval before, and not after,” putting up the fence and retaining wall which, he said, were needed after fill was brought in to level backyards. Spirer added there have been meetings with town officials, including the directors of the Planning and Zoning and the Conservation departments on the issue. Spirer said he plans to attend the Conservation Commission meeting. “I would like to have everyone operate with a true set of facts,” he said. Meanwhile, Mandell said more than 81 signatures have been collected on the petition within the first three days. The petition signers, according to its language, oppose all actions and requests by Grassy Plains LLC and Grassy Plains Development LLC to legalize work already done and/or to modify the current site plan. “We specifically take issue with the illegal construction of a retaining wall and fence, encroachment into the restricted conservation easement area and the extensive excavation and fill which all violate the current site plan, approvals by both commissions, the rules and regulations of the” town and stipulated judgment signed by the town and residents, the petition states. The PWPF was formed in 2002 to preserve 55 acres of land from the development of 31 houses. The Conservation Commission approved the development in 2002 with a long list of constraints and requirements, according to information supplied by Mandell. In 2005, the Planning and Zoning Commission denied the application, but a later stipulated agreement was negotiated for 13 clustered houses on 33 acres with 22 acres donated to the PWPF. The PWPF then donated that land as permanent open space to Earthplace.